Director – Lewis Teague, Screenplay – John Sayles, Story – John Sayles & Ray Frank Perilli, Producer – Brandon Chase, Photography – Joseph Mangine, Music – Craig Husley, Special Effects – Richard O. Helmer, Production Design – Michael Erler. Production Company – Alligator Associates/Group I. Police detective David Madison investigates the death of his partner who was attacked in the sewers. There he finds a giant alligator, once a pet that was flushed down a toilet after it grew too big. It has now grown to giant-size after having eating dogs injected with artificial growth stimulants that have been dumped down the sewers by a chemical company. As Madison tries in vain to convince the authorities of what they are facing, the alligator emerges out into the streets and starts to feed on people. It seemed inevitable that the great tabloid urban myth about baby alligators and crocodiles surviving in sewers after being flushed down toilets because they had grown too big to be pets any longer would one day fuel a monster movie. The result makes for this amusing eighties re-grafting of the classical 1950s monster movie formula. 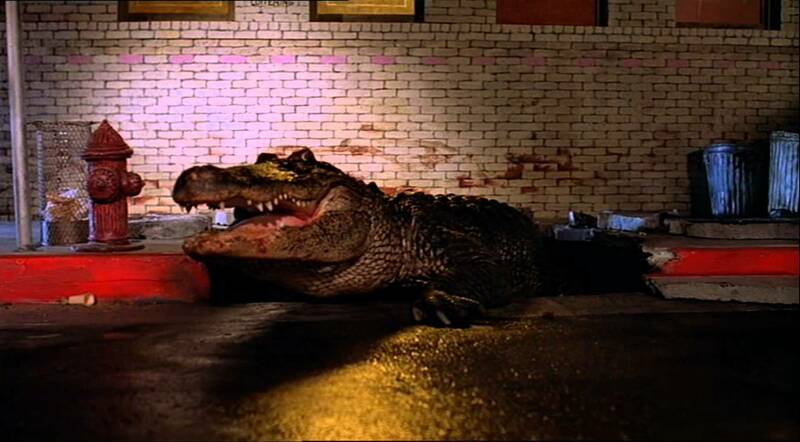 Alligator is a standard monster movie – the latter half in particular references Them! (1954). However, the screenplay, from no less than a young John Sayles, makes deft and amusing variations on cliches – Sayles did similar things with his script for Piranha (1978) – like Henry Silva’s parody on the Great White Hunter. There is a darkly amusing sense of humour at play – like the little boy who runs back and forward with kitchen knives as he tries to convince his mother, engaged in a phone conversation, of the nature of the menace, and a wonderfully nasty sequence where kids force another to walk the plank in a swimming pool. Fun. The lame Alligator II: The Mutation (1991) was a sequel. Director Lewis Teague rose to notice here and would go on to several other associations with the genre with the Stephen King adaptations Cujo (1983) and Cat’s Eye (1985), the sf film Wedlock/Deadlock (1991) and the tv movie The Triangle (2001), and other mainstream hits such as The Jewel of the Nile (1985) and Navy SEALS (1988). The script for Alligator comes from John Sayles who wrote a number of B movies like this, Battle Beyond the Stars (1980) and The Howling (1980), before making his name as a prominent indie writer/director with films like The Brother from Another Planet (1984), Matewan (1987), Passion Fish (1992), The Secret of Roan Inish (1994), Lone Star (1996) and Men with Guns (1997), Limbo (1999), Sunshine State (2002), Case de los Babys (2003), Silver City (2004) and Honeydripper (2007).